I've long been an advocate for online music stores to make their catalogue available in lossless formats. Buying music in MP3 or other lossy formats seems like a step backwards, both in terms of audio quality and the flexibility lost. Of all the lossless formats, FLAC is the one I prefer, because of its independent and open source history. 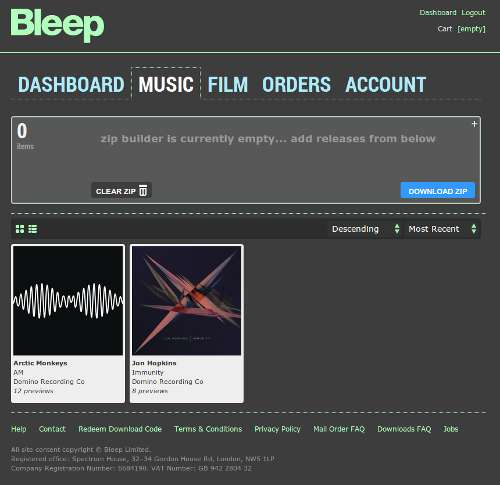 Bleep is one of the few music stores that offer FLAC downloads. With a history mainly catering for the dance music market, Bleep has become increasingly eclectic, offering indie, alternative and more classical and jazz releases. I originally thought I would purchase the latest Arctic Monkeys' and Jon Hopkins' records on CD and then rip them, as usual. However, I noticed they were for sale on Bleep, so I took the plunge. Having purchased a small amount of music already on other sites, and having noticed the different delivery formats of the music, I wondered, what should a computer music curator know about the organisation of Bleep music files? How and what metadata is recorded, and what about the album artwork and the structure of files and folders? Once all the music is added to the ZIP you can actually perform the download. So what do you get once you have downloaded your ZIP? To an extent, the initial packaging of the music download is immaterial; just like one of those familiar brown cardboard Amazon parcels, you'll soon be ripping it apart and throwing it in the "Recycle Bin" (or Trash, depending on your operating system...). I prefer to minimise data (so that strange release identifier can go) and use folders to contain a minimal amount of identifying metadata. I have other Arctic Monkeys albums, so grouping them together makes sense. Also, if I'm using a music player that only shows file names I don't have to wait until the full track name scrolls into view when browsing the music, so I would prefer shorter filenames which could be achieved by storing the files in appropriately named folders. Interestingly Bleep also include a cover art file co-located with the music files. It's a high resolution image, which is ideal for the big screen revolution. More on this below. TITLE - the title of the track, e.g. Why'd You Only Call Me When You're High? I guess it's possible that releases from different labels or publishers may contain different metadata, as often the data feed a music store receives can contain different metadata policies. In general, most of these fields are completed in the expected manner. However, there are a few notes on the way these fields are formatted. The inclusion of ALBUM ARTIST is welcome, because it helps group an album in the event that there are different track artists for a release (Various Artists albums being the obvious example). DISCNUMBER is an interesting one; Bleep includes it for all releases, including single disc ones (populated with "1"). Personally, that's not to my taste, but in some ways it makes sense for the sake of consistency. The TRACK track number fields are zero padded, which is a good move for flexibility and portability's sake. This way, you know track ordering is more likely to be respected across all music players. They've chosen to include TRACKTOTAL denoting the number of tracks in a surrounding release. Like DISCNUMBER, it's probably a superfluous tag (remember I like to keep things minimal) but it has its uses. The main omission I see that is otherwise common is GENRE. I can see why Bleep chose to not include it. Genre is a subjective field that's possible to get wrong in different ways: both in terms of subjective accuracy but also specificity. I can see why it was left out, and it's pretty easy to add it. Overall I'd give Bleep good marks for their metadata. All the important tags are there with nothing really superfluous. Artwork is an interesting one. 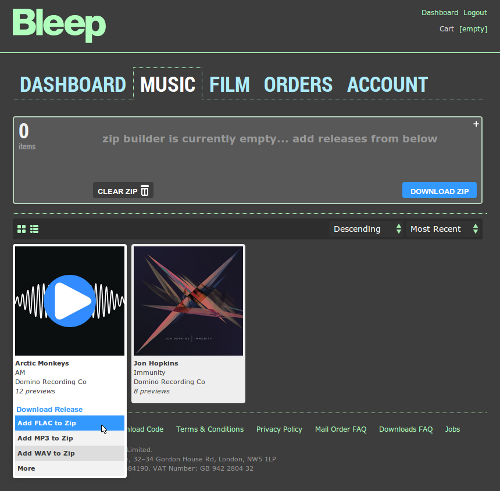 Bleep downloads include a co-located image file (as briefly mentioned above) and artwork is embedded in each file. So far, so good! However, the artwork, while being the same image, is of a different resolution. The co-located image file is a large, 1.4MB 1400x1400 resolution image. This is high enough a resolution for displaying in full screen mode on a television. However, the embedded artwork is just 34KB and is 800x800 in resolution. I'm a bit dismissive of storage concerns, so this difference annoyed me a little. Some software uses embedded artwork by default, and so the higher quality art may not be displayed. Those that are concerned about storage space (and my email inbox is testament that they exist!) will welcome this, however. So how do I use bliss to tune the Bleep metadata and artwork? There are four things to consider, to massage the files to my tastes: the file organisation, DISCNUMBER, GENRE and the artwork. File organisation is pretty straightforward. I continue to operate a <artist_name>/<album_name>/<tracknumber:nn>-<track_name> scheme, so that's what I set bliss to apply using the file organisation rule. DISCNUMBER is a problem to me because my file organisation rule is customised to treat releases without a DISCNUMBER differently. Single disc releases go into a simple artist/album/tracks structure, while those with a DISCNUMBER (multi disc releases in my collection) have separate folders within the album folder for the different discs. This means Bleep single disc releases are stored in an arguably superfluous "1" folder under the album. Greater flexibility in the file organisation rule would help, but instead I simply remove the DISCNUMBER fields. GENRE is an easier one to consider. My missing genre rule is always enabled so I can soon fill that in. Managing the artwork is the final issue. bliss doesn't show multiple artwork stored for a release. The best it does is, if there are different resolutions, they will all be listed in the artwork assessment screens. Choosing to change artwork to another piece will overwrite all artwork. I prefer to have artwork all the same, with the same high quality artwork embedded in the music files, so I use the Upload feature to upload the same co-located image file provided in the Bleep download. This overwrites the existing image file with the same image, but then all of the embedded artwork with higher quality versions. I was very impressed with Bleep's usability and their metadata. Give 'em a go! Thanks to bleep for allowing us to use their logo above.